This is both a popular event in Santa Barbara, and a centrally located run taking in some great spots. 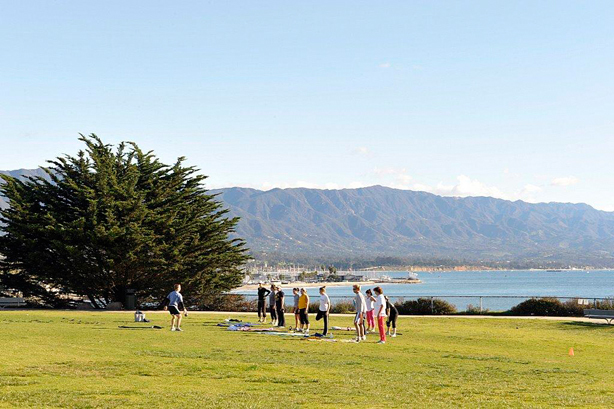 Santa Barbara has droves of running competitions, but this 5K remains popular as a family friendly sunset run in a central location, complete with unbeatable views through Shoreline Park. Nite Moves, now in its 29th year, is “a truly a special community event,” says Race Director Jay Campbell. On Wednesday nights throughout the summer, $25 buys participants entry into a 5K run/walk, a 500m dash, and a 1K or a 2K swim. (The 5K run and the 1K swim can be combined for the “aquathlon”). There are elite runners and triathletes, beginning runners and swimmers, families, fitness groups and enthusiasts, and those who just love a great time at the beach…plus after the race runners and swimmers hang out for drinks, appetizers, fruit, salad, fish tacos, and ice cream. Not in town on a Wednesday? Complete the 5K on your own: Start out from the south end of Shoreline Park, head up the coast on Shoreline Drive to La Mesa Park, then double back all the way to Leadbetter Beach while the sun sinks over the palm-laced Pacific. Add-On: Continue south of Leadbetter Beach on the trail around the harbor, and then connect with our Santa Barbara waterfront run. 5k (3.1 miles) RT. Good add-on option is north if Leadbetter beach, around the Harbor.